Did you know that the VISUAL.INI file can be used to control auto-issue of material to work orders? If N, then material quantity issued to the workorder is based on good pieces only and does not include any deviated quantity. If Y, then material quantity issued to the workorder is based on both good and deviated quantity. Another method is to use the setting that is controlled from within Labor Ticket Entry/ Preferences which will add the fixed scrap or scrap % to the good pieces that you report in labor ticket entry. So, if you report only good pieces and want to auto issue additional material based on the standard scrap % in the operation card, you can control that with the Labor Ticket Preference setting shown below. 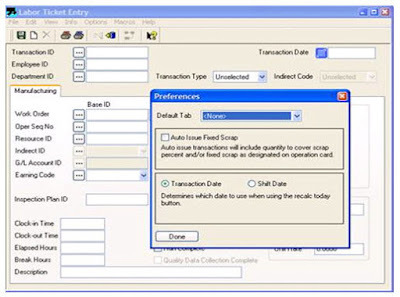 Auto issue transactions will include quantity to cover scrap percent and/or fixed scrap as designated on operation card. If Y than auto issue material based on Scrap %, if N will not auto issue additional material. This edition of VISUAL Did You Know was provided by BizTech VISUAL Consultant Joe Horvath.